Cassava Coconut Wraps is our newest coconut wrap flavor and people are loving it! Now you can get back to enjoying your sandwiches and wraps with our more mild flavored coconut wrap. These wraps are gluten-free and can be used in place of bread or tortillas. You’re probably already familiar with coconut, but what about cassava? It’s a root plant that is most well known for its contribution to tapioca. It’s more common in other parts of the world but is finally stepping into the spotlight in the United States due to its growing list of health benefits. Here are 5 health benefits of cassava and coconut wraps. Not all of the starch that you consume is fully digested by the body. A type of starch that isn’t digested is called resistant starch. You can easily compare resistant starch to soluble fiber. Not only do resistant starches behave somewhat like soluble fiber, but they also have some similar health benefits. Some of those benefits aid in weight loss. Cassava is packed with resistant starch. It helps to decrease insulin spikes, manage appetite, and it decreases the amount of fat that is stored in cells. It’s also a great addition to a diet when exercising regularly because it can help to maintain lean body mass while you burn fat. Both, the cassava and the coconut benefit the digestive system in different ways. Coconut is digested differently than many types of foods. This unique digestion leads to some unique health benefits for the digestive system. It is commonly used to reduce the symptoms of IBS. It can also reduce inflammation and help with regularity. As for cassava, it is once again the resistant starch that has the most noticeable impact. Resistant starch is not digested by the body, but it does feed many of the good bacteria in the gut. These bacteria improve health in a number of ways, including reducing inflammation and helping with nutrient absorption. In the past, it was thought that all saturated fats were bad for the body. Our understanding of nutrients has come a long way since then. We now know that coconut contains a number of healthy saturated fats. These fats benefit the body in a number of ways. They help burn fat, boost brain efficiency, and raise HDL cholesterol. HDL is called the high density lipoprotein cholesterol. By increasing HDL a reasonable amount you can lower your risk of heart disease. Meanwhile, the cassava is full of saponins, which work a lot like antioxidants to keep the heart healthy. Many of the Cassava + Coconut 5 Nutrition Facts and benefits already listed have a direct effect on diabetes management. Cassava and coconut can help manage diabetes by improving digestion, controlling the appetite, and reducing insulin spikes. It also contains a variety of healthy vitamins and minerals that are necessary for a well-balanced diet. Having a healthy and balanced diet is a very important part of properly managing diabetes. Finally, the energy boost provided by the coconut is great right before beginning a workout. Cassava and coconut aren’t exactly nootropics, but they can boost brain energy and improve brain health. In this particular case, it is the coconut that is the star of the show. The healthy saturated fats that were mentioned early lead to a short burst of brain energy after consumption. That means you can use cassava and coconut to prepare for an exam just like you can use it to prepare for an intense workout. The saturated fats in coconut are converted to ketones in the liver. The ketones are what provide the brain with energy. Ketones have a number of interesting health benefits. They are often used as a treatment for children with epilepsy and seniors with Alzheimer’s. 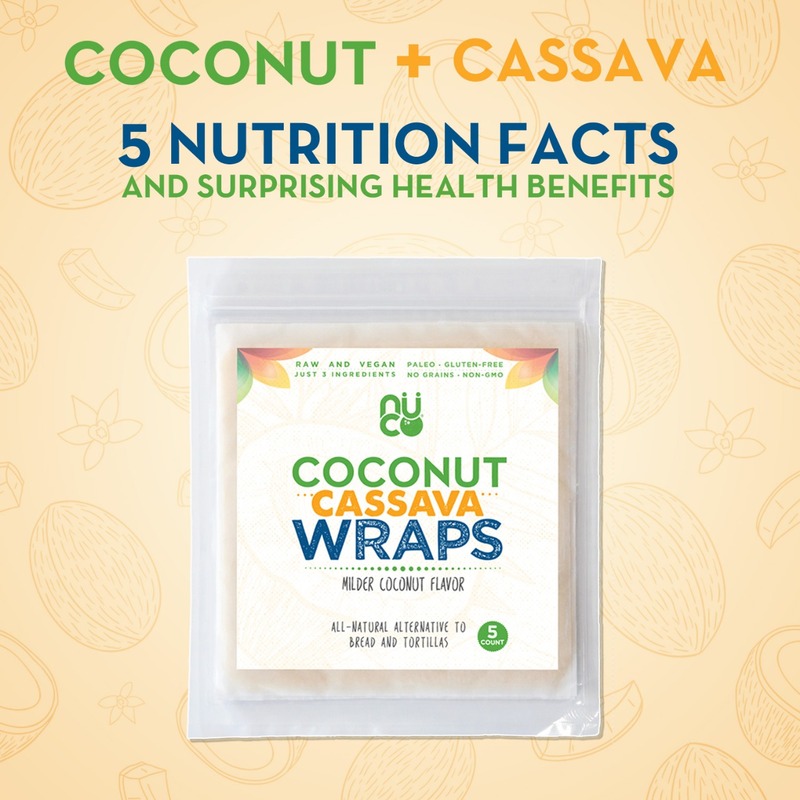 These Cassava + Coconut 5 Nutrition Facts and benefits make cassava coconut wraps seem like a healthy alternative to traditional grains. They improve heart, brain, and digestive health while aiding in weight loss and diabetes management. That’s an excellent combination of benefits for something that only has three ingredients.